Instagram launches walkie-talkie voice messaging feature. The blog post will guide you how to use the feautre. Instagram recently rolled out a new iMessage like walkie-talkie voice messaging feature. The similar feature was added to Facebook’s other platforms WhatsApp and Messenger years ago, and now similar feature is making it way to Instagram. The company was testing walkie-talkie feature from last few months and finally, it is available for people all across the globe. With the help of this new feature, Instagram users no longer have to start a live conversation to make voice chats. The new walkie-talkie voice messaging feature is a part of direct messages on Instagram. If you want to start a voice messaging conversation with your friends, then all users have to do is to press down a microphone button to start recording a voice message and the recipient (individual or group) can listen to the same message just by pressing the same button. Just like like we use a walkie-talkie. So if you’re bored of sending text messages, then use this feature to send a heartfelt message or send a quick reply when you both don’t have a handsfree. The same voice message will appear on the chat window in the audio wave form. Users can record voice message upto one-minute and will stay permanently in the chat window instead of disappearing. With the help walkie-talkie voice message feature, users can make solo and group chats on both Android and iOS device. 1. First of all of all, you need to update the Instagram app to the latest version available for both Android and iOS devices. 2. Launch the Instagram app on your phone. 3. Next, tap on the ‘Direct message‘ icon available on the upper right corner. You will get the list of people with whom you have made conversations. 4. From the list, select the person to whom you want to send a voice message. 5. In the chat window, you will see a new Walkie-talkie icon visible at the bottom of the screen. Here press and hold the Walkie-talkie button and start recording the message. Once done, release the button. The voice message will be sent to your friends. 6. To listen to the voice message your friend have to press the play button available on the voice message in the audio wave form. 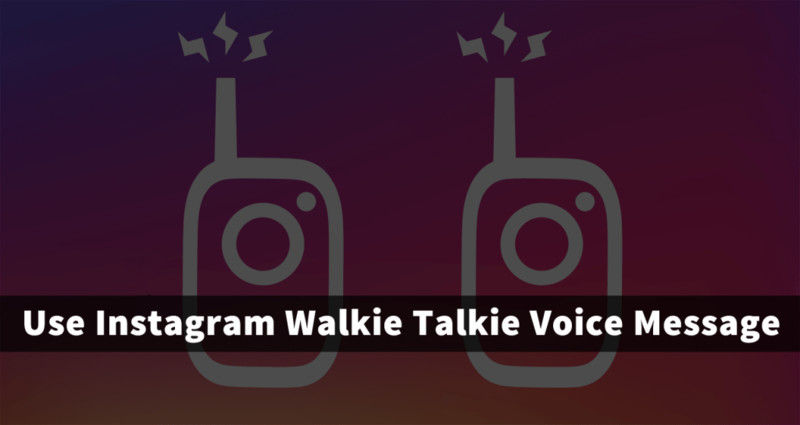 That’s all about Instagram’s Walkie-Talkie voice message feature. This is handy feature for the users who hate typing long messages or the people who speak language which is not recognized in digital world. What are your thoughts about new Walkie-Talkie feature of Instagram Direct? Feel free to share your thoughts in the comments.